A wealth of abstracts were presented at the 54th Annual Meeting of the American Society of Hematology (ASH), held in Atlanta, Georgia, on December 8-11, 2012. More than 18,000 hematologists and other healthcare professionals from around the world gathered to discuss the latest clinical developments in research, therapies, and practice strategies. Attendees had the opportunity to review thousands of selected scientific abstracts. Following are some of the highlights from the ASH annual meeting. Studies have suggested that musculoskeletal toxicity associated with aromatase inhibitor therapy can lead to noncompliance in up to one-third of women with breast cancer. The clinical response to regorafenib does not depend on tumor mutations. Among patients with metastatic colorectal cancer who participated in the phase 3 CORRECT (Colorectal Cancer Treated With Regorafenib or Placebo After Failure of Standard Therapy) study, an analysis of tumor specimens for KRAS and PIK3CA mutations did not predict clinical benefit in the patients assigned to regorafenib compared with placebo, said Michael Jeffers, PhD. 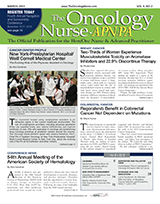 With this issue of The Oncology Nurse-APN/PA (TON), we continue our coverage of the news from the 54th Annual Meeting of the American Society of Hematology (ASH) and the San Antonio Breast Cancer Symposium (SABCS). The US Food and Drug Administration (FDA) approved ado-trastuzumab emtansine (Kadcyla for injection; Genentech) for single-agent use for treating patients with HER2-positive metastatic breast cancer who previously received trastuzumab and a taxane, separately or in combination. Approval for ado-trastuzumab emtansine was granted on February 22, 2013. Although there are several hereditary risk factors related to kidney cancer, there also are lifestyle choices that can increase a person’s risk of the disease. In August 2012, vincristine sulfate LIPOSOME injection (VSLI) (Marqibo) was granted accelerated approval by the US Food and Drug Administration (FDA) for the treatment of adult patients with Philadelphia chromosome-negative (Ph-) acute lymphoblastic leukemia (ALL) in second or greater relapse or whose disease has progressed after 2 or more regimens. At the ASH plenary session, investigators showed that acute promyelocytic leukemia (APL), traditionally one of the deadliest hematologic malignancies, can be treated without chemotherapy. OnPART can predict 6 common side effects of dose-dense doxorubicin plus cyclophosphamide plus paclitaxel chemotherapy in patients with breast cancer with a high degree of accuracy, according to the results of a study presented at the CTRC-AACR San Antonio Breast Cancer Symposium. Adverse effects (AEs) with regorafenib tend to occur early—during the first treatment cycle—and then quickly taper off.